The Detroit Public Schools Book Depository has been abandoned since a fire struck the building in 1987. Designed by the well regarded Detroit architect Albert Kahn in the 1930s, the 4 story building was originally built as a post office before being converted to a warehouse holding school text books and other school supplies for Detroit school children. 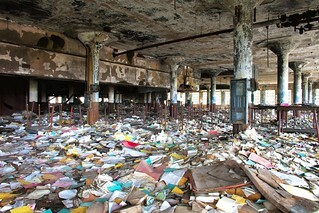 As Detroit's population has contracted, many schools have closed and are now shuttered and abandoned. More recently, in January of 2009, The Detroit News reported on a case of a dead man who had frozen inside a block of ice in an elevator shaft in the building. As the story goes, the dead man was phoned in to a reporter rather than the police because the photographer/urbex explorer and his friends who were playing hockey on the ice in the basement didn't want to call the police for fear of getting in trouble for trespassing. At present the book depository and Michigan Central Station across the street are owned by Detroit billionaire Matty Mouron who also owns the Ambassador Bridge, the main bridge connecting Detroit to Canada. On the day that I visited the basement was flooded. We only ran into one person living in the building, who asked us to keep away from the windows while we visited so as not to draw attention from the outside. On the fourth floor of the building nature has begun to reclaim this building and a small forest has taken root inside the building opening to a massive skylight in the roof. This place definitely ranks up there in one of the most interesting abandoned buildings I've ever photographed.